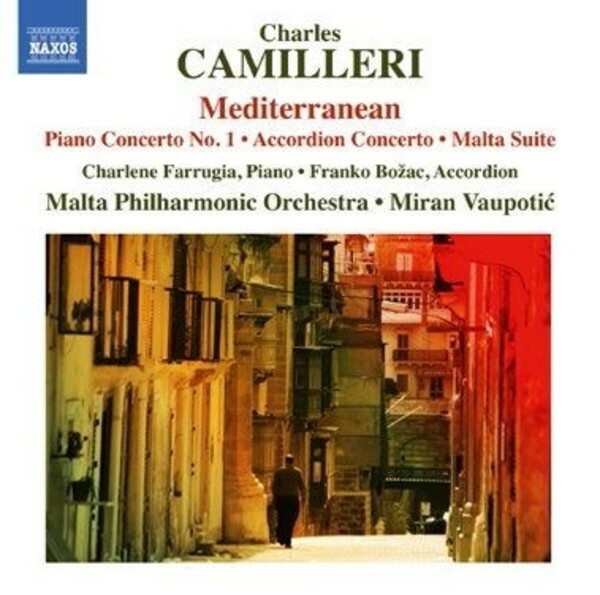 The three works on this recording come from the first phase in the musical development of Malta’s prolific composer Charles Camilleri, and are some of his most rewarding and enduring works. The Piano Concerto No.1 ‘Mediterranean’ owes much to the Romantic concerto tradition but is suffused with the distinctive flavours of music from southern Europe and North Africa. A virtuoso of the accordion, Camilleri wrote a Concerto for the instrument that journeys humorously from the eighteenth to the twentieth centuries. The Malta Suite, a set of colourful dances, is widely considered the island’ s musical emblem. Because of his teaching appointments Camilleri is still remembered in the UK, USA and especially Canada. His memory is still vivid in his native island and the Waltz from the Malta Suite recorded on this disc is played every day in one of Valletta’s main squares (Valletta is the Maltese capital). These three works date from his early Nationalist phase where he fused Maltese and Mediterranean folk tunes to ‘art music’ traditions, similar to works by de Falla, Bartók and Vaughan Williams. The music is brilliant and approachable - the Piano Concerto would make a good Prom piece!